From my previous post - (Introduction), I mentioned that I would like to demonstrate a personal portfolio management that I have been practicing since I was in early 20s. From the image above we see 4 quadrants and the equities(which means that your own money). Let us explain in more details on the 4 quadrants here as well as the arrow movement here. Non current assets here means the asset that you cannot liquidate it in very fast period. For example the car, the house as well as marketable securities such as fixed income instruments. In other term, non current asset also can stand for the asset that you wish to hold for more than 1 year. Good will or any kind of intangible assets categorized under this category as well. To categorize 'Asset', you must make sure that the asset can bring you benefit (in cash form or non cash form) in long run. For example, a car can be an asset if you can utilize the car to bring in more sales / customers by traveling around the world. Non Current Liabilities here means that the mortgage loan or car loan that you have taken from the bank to purchase your asset. Normally bank will give you personal loan to purchase the car and real estate and/or other non current asset. So you must be very careful and selective on the assets that you wish to purchase. Normally the non current liabilities will have certain loan interest that you have to pay to the banks. 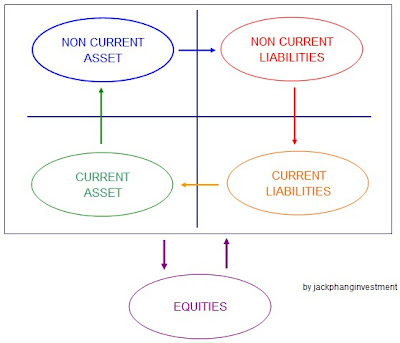 Current Asset basically consists of cash & equivalents and any other form of current asset. As this is your personal portfolio, there should not be any receivables or inventory in your personal portfolio. So what I can think of is the investment assets and cash assets. Investment Assets can be in the form of any kind of financial products such as Structured Products, Unit Trusts, REITs, Shares, ETFs, Futures etc and cash assets can be in the form of money market funds, fixed deposit and cash. I would categorize Foreign currency FD under cash assets although it brings currency risk. This is my own opinion. You may seek advice from your Financial Adviser for detailed information. I also put the 12 months foreseeable gross income under Current Asset such as the rental income, blog income as well as any other active income. This is a creative idea that I would like to use the financial ratio (which I shall explain in coming posts) to analyze my current financial situation (or in other words, whether my personal portfolio management is working fine or not). Equity here means your net worth after deducting all total liabilities from your total asset. Equity is the result of the arrow movement of the 4 quadrants. The faster the movement is, the bigger possibility the equity can grow bigger. Next, I shall introduce you the arrow movement in the quadrants as well as between the quadrants and equities. When you purchase a huge and long term asset, normally you do not have a huge equities to support you. Hence, you will have to take loan from the bank to support you. If you purchase non current assets, normally you will have to increase your non current liabilities. So for this reason, you should be very careful at acquiring your non current assets. Normally after you take the loan from bank, you have to serve the loan for long term period. For example, a 30 years mortgage loan means that you have to serve the loan for up to 30 years. Please note that, the non current liabilities will bring in more current liabilities as current liabilities is normally come from the loan payment within 12 months (in my own opinion). After you start paying for the mortgage loan, it is also time for you to create more current asset in the form of capital gain. dividend income or rental income etc. For example, after you have served the non current liabilities by paying the loan interest to bank, you can at the same time collecting the house rentals from the tenants. As time grows longer, you will have more Current Asset. 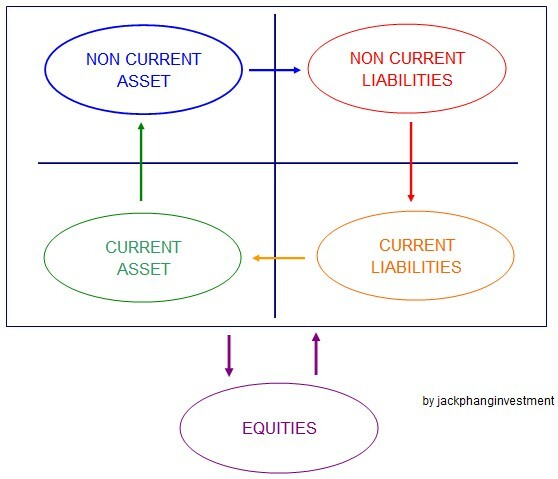 After you have more current asset, you will be able to purchase more non current assets that can bring you more current asset eventually as the arrow flows from non current asset -> non current liabilities -> current liabilities -> current asset -> non current asset. In next coming posts, we will describe in more details on how each quadrant works and what are the things you have to take note to handle the cash flow in between the 4 quadrants.